Welcome to our online shop, to choose and buy your favorite goods! This mommy stroller hook suits almost every make and model of stroller.When you are struggling with numerous bags and diapers while you're on a stroll with your newborn baby at the mall or jogging with your toddler in the summer sun, this hooks will promise you a much easier stroller . -Please allow 1-3mm error due to manual measurement. Please make sure you do not mind before you bid. -Due to the difference between different monitors, the picture may not reflect the actual color of the item. If you have any questions regarding them , please contact us. Click on the buy button now to get your goods! Material:Made of aluminum alloy material which is durable,anti-corrosion and high-strength with a foam grip to prevent sliding or slipping. Size:it is 6.3" x 3.9" ,Fit all kinds of baby strollers. 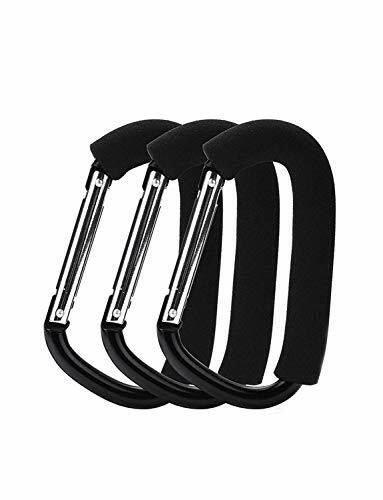 Function: You can hang this hook on the stroller with diaper bag, backpack, wallet, Dog leash,With a foam grip, the hooks are ideal for carrying shopping bags or grocery bags while shopping without hurting your hands, and they are perfect for transporting bags from your car to the house. Simple installation and easy to use: Just hook it on a stroller,the automatic locking design of hooks ensures that the items will not fall easily. Locks the stroller hooks in place. It will not slip or fall, and provides a comfortable grip for you or your toddler. Keeping your hands on stroller while walking ensuring the safety of your children.